Standing on the foundations of America’s promise of equal opportunity, our universities purport to serve as engines of social mobility and practitioners of democracy. 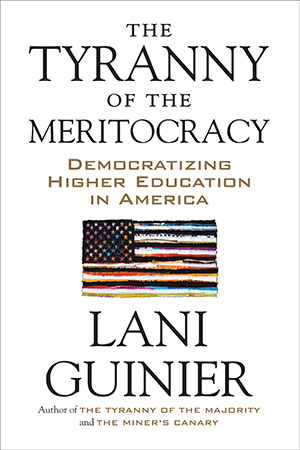 But as acclaimed scholar and pioneering civil rights advocate Lani Guinier argues, the merit systems that dictate the admissions practices of these institutions are functioning to select and privilege elite individuals rather than create learning communities geared to advance democratic societies. Having studied and taught at schools such as Harvard University, Yale Law School, and the University of Pennsylvania Law School, Guinier has spent years examining the experiences of ethnic minorities and of women at the nation’s top institutions of higher education, and here she lays bare the practices that impede the stated missions of these schools. Goaded on by a contemporary culture that establishes value through ranking and sorting, universities assess applicants using the vocabulary of private, highly individualized merit. As a result of private merit standards and ever-increasing tuitions, our colleges and universities increasingly are failing in their mission to provide educational opportunity and to prepare students for productive and engaged citizenship. To reclaim higher education as a cornerstone of democracy, Guinier argues that institutions of higher learning must focus on admitting and educating a class of students who will be critical thinkers, active citizens, and publicly spirited leaders. Guinier presents a plan for considering “democratic merit,” a system that measures the success of higher education not by the personal qualities of the students who enter but by the work and service performed by the graduates who leave. Guinier goes on to offer vivid examples of communities that have developed effective learning strategies based not on an individual’s “merit” but on the collaborative strength of a group, learning and working together, supporting members, and evolving into powerful collectives. Examples are taken from across the country and include a wide range of approaches, each innovative and effective. Guinier argues for reformation, not only of the very premises of admissions practices but of the shape of higher education itself. SUSPENDED ON STEAM tunneling up from the government-issue heating grates, the last of the fall foliage dances just beyond the windowpane. In the crisp autumn air, the leaves ricochet off the grimy glass before coming to rest on the banks of the buildings’ curved cement ledge, just outside the science classroom. These dancing leaves are barely visible to the sixteen- and seventeen-year-old teenagers unpacking their book bags atop rows of smooth, black Formica countertop, crowded with petri dishes, glass beakers, and gas blowtorches. It’s a Monday morning in November, the time of year when high school seniors around the country carefully calculate their college admissions odds. A solemn stillness reigns as nine boys and one girl wait for the Advanced Placement physics teacher to begin the double-period lesson that is the toughest course in this public school. Of the seven high school seniors and three juniors, only one—a policeman’s son—does not have parents who graduated from college. Nevertheless all ten students are preoccupied with the same thing: getting into college. "Who remembers what the force on a turning object is called?" The teacher surveys the room as he toys with a piece of chalk. A hand from the front row shoots up. “Torque!” cries the son of a computer engineer. Wisps of his tousled, orange hair outline his pale face, suddenly ruddy with his excitement. A loud thump echoes through the classroom as the front legs of the second boy’s chair hit the floor. His eyes narrow. The smile on his face dissolves in a brew of contempt and hurt. The orange-haired boy's sly excuse has worked. He was proud to know the answer to the teache's question; but his real agenda was to broadcast his perfect SAT scores. Except for the scraping of the chalk on the blackboard, the room is quiet. But unable to contain his enthusiasm, the braggart with the orange locks interrupts the class several more times, proclaiming his flawless SAT scores again and again. Awe morphs into disgust among his classmates, yet no one else speaks out. The policeman's boy squirms. He sits hunched with his elbows cocked on his desk, his stubby fingers cupping his chin. Finally, after the fourth unanswered SAT-score announcement, the policeman's boy sits straight up, his face still glowering from the earlier insult. "That's enough," he snarls. "Shut up already about your scores." Another student, a tall, long-limbed boy, enters the fray. His parents both graduated from an Ivy League college, and his dad is a science professor. This leggy fellow chewing on a pencil has said nothing all class, but he now pitches forward in his chair as he calmly assumes the role of defense attorney for the braggart. "If I got a 1600," the college professor's boy says, "I'd be talking about it too." The policeman's son grimaces. His lip curls as he reluctantly acknowledges the shifting classroom alliance. It is now two against one. He plants his hands on the desktop. "Maybe so," he mumbles and briefly contemplates the thought that the SAT creates a special exception for crude boasting. "But it doesn't mean you have to be a jerk," he finally shoots back. For the immodest boy who has hit the SAT jackpot, there is no difference between accomplishment and arrogance. In the terminology of the SATs, a 1600 (or a 2400, depending on what year the test was taken) is an achievement worthy of mentioning—several times. Indeed it is such an accomplishment that it cries out for mention not just by the boy with the perfect scores but by his peer advocate as well. Both the boastful boy and his tall, lanky supporter know the game. The rules, so the thinking goes, are objective, neutral, and, above all, fair. And that boy won. Using the SAT test as a yardstick, college admissions officers select who they think are the best-prepared students, meaning those likely to get the highest first-year grades. Presumably the SAT not only measures college preparedness; it also provides an incentive system for high school students to work hard and take a rigorous curriculum. The tenets of high-stakes admissions testing—the testocracy—have become so widely shared that they form the building blocks of a secular religion among college-bound elites: if you test well, you deserve to enter a top college. In some ways you have earned the right not just to succeed but to preen. And, such students might think, you owe nothing to anyone, not to the community whose tax dollars supported your AP physics lab with a teacher/student ratio of one to ten, and not to your classmates, whose own egos and futures are also on the line. The testocracy, a twenty-first-century cult of standardized, quantifiable merit, values perfect scores but ignores character. Indeed, the boy with the winning scores, derisive grin, and bad manners could be a poster child for the closely fought college admissions competition. The testocracy teaches the cocky boy to internalize success and to take personal credit for the trappings of privilege, including the educational resources and networks of his college-educated parents. He has learned that individual achievement trumps collective commitment. Those who reach the finish line faster will reap their rewards here on earth. And one of those rewards is the right to brag. The boy still squirming with resentment in the back row knows the difference between being proud and being a jerk. He has the instincts of character. One should not boast, preen, or complain. Yet, he knows that, to the academic world, his character counts less than his SAT scores. He knows that the SAT opens doors to the best schools and by extension to long-term success. This boy is from a working-class family. The son of the policeman and the school secretary, he is hoping to be the first in his family to attend college. But in order to give himself and his children-to-be a better life than his parents could provide for him, he needs financial aid. He plays hockey, but because he barely got 1300 on his SATs, his athletic skill was not enough to win a much-needed scholarship. Thus far he is losing in the college admissions contest. His test scores and his self-esteem both take a beating. Reduced to protesting from the back row, he struggles to compete while staying grounded. His parents cannot afford SAT prep classes. He will simply retake the test hoping that his scores improve. CHAPTER TWO: Aptitude or Achievement?